Model VE flow meters by Kytola are heavy-duty instruments designed for use in industrial applications such as lubrication oil measurement, flush water applications, gas flow measurement, and sealing and cooling water measurement. 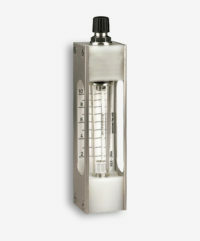 The Model VE variable area flow meters are constructed with an impact-resistant polymer flow tube encased in stainless steel (AISI 316) side plates for added protection. It also features a flow adjustment valve on the outlet and can be customised with a high/low flow alarm, a constant flow regulator and various material options. Alternative designs can be found in the Model VD and the Model VL.